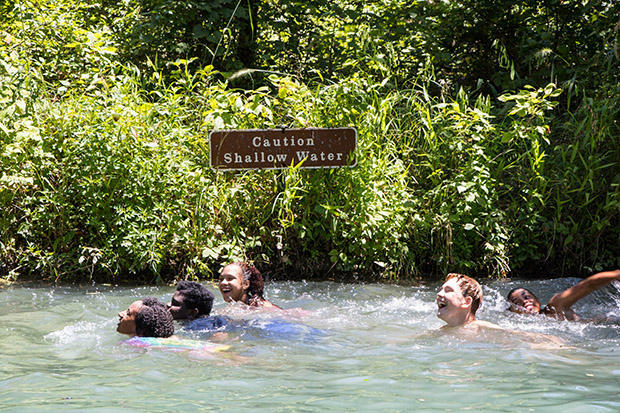 Kids from a local youth organization laugh and splash in cold, spring-fed pools at the Chickasaw National Recreation Area near Sulphur, Okla.
It’s around 100 degrees near the town of Sulphur in the south-central part of the state in late July. The soggy, sickening heat clings to the skin and fogs the glasses. Weather forecasters have urged the public to just avoid going outdoors. Denine Cumins brought her daughter, Sunshine, to camp for the weekend. Sunshine’s friend, Breanna Starnes, joined in for the three-hour trip from their hometown in Texas. This cold, clear water comes from an aquifer-fed spring, a unique water source in a region with a drought-filled history. And while the three women are enjoying scenery administrated and maintained by the National Park Service, the Chickasaw National Recreation Area is not a national park — but it used to be. 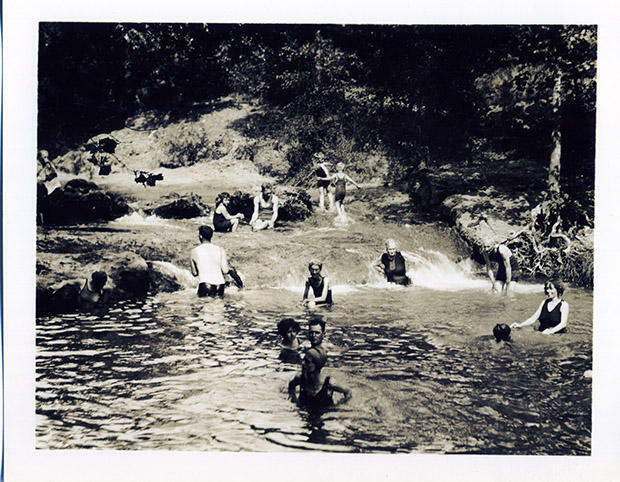 Bathers enjoying a spring-fed pool at Platt National Park in the 1920s. Debbie Sharp is the president of the Friends of Chickasaw National Recreation Area, a nonprofit group that supports the park. For over a century, she says, the water near Sulphur has been a gathering point for locals, travelers and tribes that were forcibly relocated to land that later became Oklahoma. Word of the “Oklahoma Oasis” spread and the promise of healing hydrotherapy became a magnet for tourists, who flooded in by the trainloads to soak and drink from the mineral-rich water. Native American tribes were worried city entrepreneurs would turn the springs into a private spa, so they worked out a deal with the federal government. The area was “set aside as Sulphur Springs Reservation by agreement with the Chickasaw Indians in 1902,” Albert J. Parker, now an emeritus professor at the University of Georgia, writes in “A Park of the People,” a detailed paper on the park’s history. The reservation was designated as Platt National Park in 1906, further protecting the springs as public commons. By the 1920s, Parker writes, it was one of the country’s most-visited national parks. “It’s really different from the other national parks because it doesn’t have this grand scenery,” says Heidi Hohmann, a professor of landscape architecture at Iowa State University and principal investigator behind the National Historic Landmark nomination for Platt Historic District. Hohmann says Platt always struggled to stand out at the national level. It was the smallest national park. It had streams, but no raging rivers. It had hills, but no majestic mountains. There’s a catch: Most of the landscape visitors see at the park today isn’t natural. During the New Deal, the Civilian Conservation Corps planted hundreds of thousands of trees and shrubs, carved trails and piped spring water to pavillions. Even the bison herd was transplanted. “It’s like this improved nature,” Hohmann says. And the improvements worked: Park attendance soared. 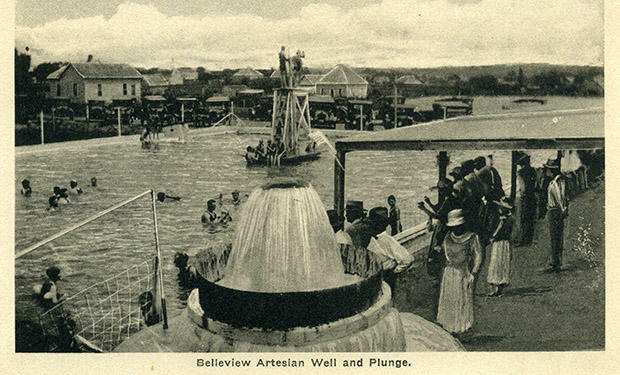 A postcard from 1924 shows off the "Belleview Artesian Well and Plunge" at Platt National Park. From the moment it was created 100 years ago, Hohmann says, the National Park Service has struggled to balance two often-opposing ideals. “We’re going to protect these things and we’re going to provide for enjoyment. That’s the dual mandate,” she says. And sometimes one of those mandates is emphasized more than the other. Despite its popularity, Platt lacked both scenic grandeur and political influence; it did not fit prevailing images of wild nature among NPS bureaucrats and the urban elite who formed the core of the environmental movement; it was too small, too humanized, and too ordinary. In 1976, Platt met a fate shared by only a handful of national parks: It was demoted. Platt was combined with the nearby Lake of the Arbuckles and re-branded the Chickasaw National Recreation Area. About two million people visited Chickasaw National Recreation Area in 1976, data from the National Park Service show. The recreation area has enjoyed boom years, but annual attendance has, generally, declined since it was demoted. 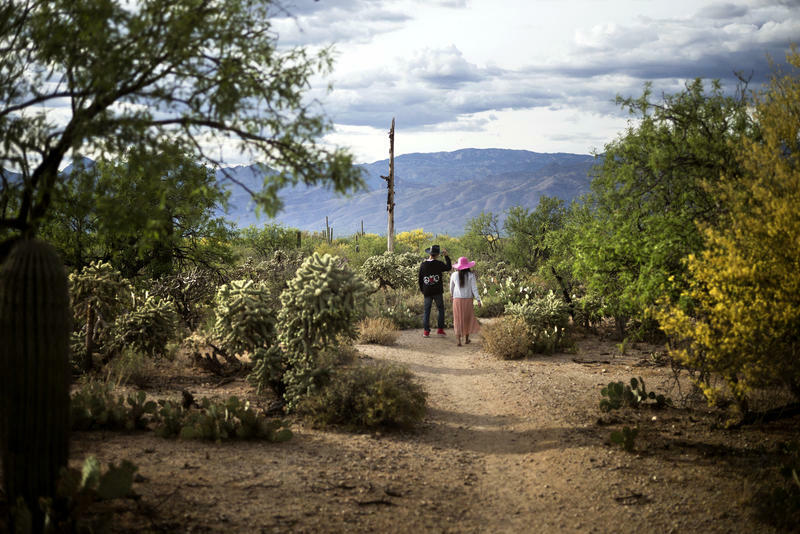 About 1.3 million people visited the recreation area in 2015, data show. The official designation has little to do with the day-to-day administration of the recreation area, which, along with more than 400 other sites — including monuments, memorials, historic sites, seashores, scenic rivers and battlefields in Oklahoma and other U.S. states and territories — is the responsibility of the National Park Service. Still, Debbie Sharp with with Friends of Chickasaw, says the demotion pushed the recreation area off the nation’s map. 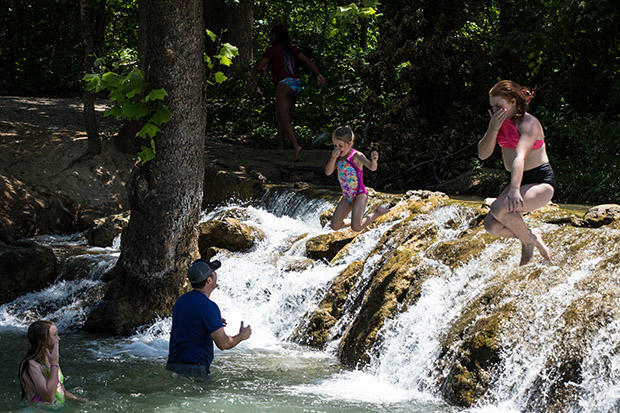 Kids jump off the "Little Niagara" waterfall at Chickasaw National Recreation area near Sulphur, Okla. The Chickasaw Recreation Area does have one feature many of its more impressive national park cousins lack: Admission is free. During StateImpact’s visit on a Friday in late July, campgrounds were starting to fill up, picnic tables were packed with families, and kids were racing out of youth group school busses to jump off waterfalls into the icy, clear water. Back at the spring-fed pool, in a shady spot near a waterfall, visitor Denine Cumins isn’t that concerned with a formal national park designation. Up next, we want to introduce you to a couple of the guys who are responsible for cleaning up the bathrooms at Great Smoky Mountains park. Not pretty, but somebody's got to do it. NPR's Nathan Rott takes it from here.